It's been going for a few weeks now and we've tried and tested it's ubiquity so we know it's the hookup. 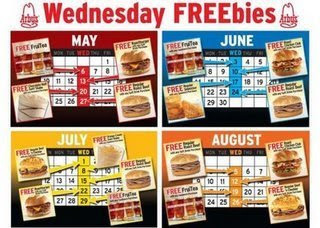 Every Wednesday beginning through August, Arby’s is offering Wednesday FREEbies, which include classic Roast Beef sandwiches, the new Roastburger, Roast Chicken Club, premium Iced FruiTeas, mouth-watering Sidekickers, such as Loaded Potato Bites or Mozzarella Sticks, and swirl shakes. At Participating Locations Only (most seem to be participating). We at Qmania are proud to help spread the word on the best deals around. If you're a business owner, learn more about what and how we do here. If you are interested in more Arby's freebies and promotions, go here to sign up for the Arby's Extras program.